Orders Before 2PM PST Ship Same Day! You're ready to order but you need it right away... No problem, our warehouse staff's #1 priority is to get your order packed and shipped out today! * Free shipping is not valid or offered on any orders using any other promotional offers or discount codes. **Orders placed before 2pm PST will usually be packed and shipped same day for all in-stock items! Please be aware that due to wildly fluctuating supply and large demand a very small percentage of orders may incur a short back-order wait if sales suddenly spike for that item. 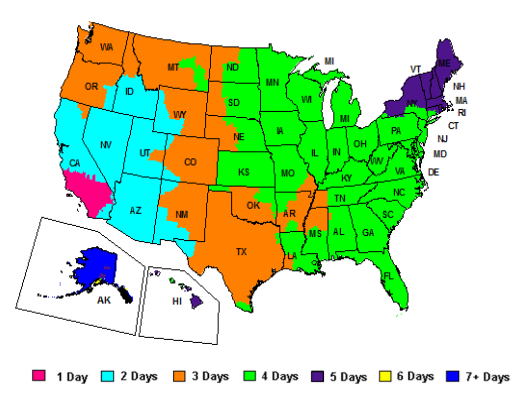 AirRattle will ship most items with Fedex ground service ( See delivery times by state above) including FREE Saturday delivery unless you choose express service. Any shipping method change will appear on your order comments. Customers in Hawaii and Alaska will be emailed from our professional customer service agents to address any shipping surcharges. We ship Monday-Friday 9am-5pm (excluding weekends and/or some holidays). After we receive your order it will be processed to ship same day, unless your order was placed after 2pm PST. As a earth friendly and green company we reduce our environmental footprint by utilizing various packaging materials that keep your shipment well protected. AirRattle will ship purchased items to your billing address or your verified gift address. To take proper precautions over increasing credit card fraud from online orders, we reserve the right to directly contact the card holder via email or phone to verify the validity of the order before it ships.